1 of 5 Heat oven to 350 degrees F. Coat three 9 x 2-inch baking pans with nonstick cooking spray. Line bottoms with wax paper. Coat paper. 2 of 5 In a large bowl, whisk together flour, baking powder, salt and baking soda. Set aside. 3 of 5 In a second large bowl, beat butter until creamy. Add sugar and beat until fluffy, about 2 minutes. Add eggs, 1 at a time, beating well after each addition. In a medium-size bowl, mix together milk, juice, yogurt, zest and vanilla. 4 of 5 On low, beat flour mixture into butter mixture in 3 additions, alternating with orange juice mixture. Beat on medium 2 minutes. Divide batter among prepared pans. 5 of 5 Bake at 350 degrees F for 30 to 32 minutes, until toothpicks inserted in centers come out clean. Cool cakes on wire rack 10 minutes. Turn cakes out onto rack; remove wax paper. Cool completely. Trim cakes with serrated knife if necessary. 1 of 3 Beat butter in a large bowl until fluffy, about 1 minute. Add confectioners sugar, orange juice, milk and extracts. Beat on low 1 minute until blended. Beat 1 minute until smooth. Add 1 to 2 more tablespoons of milk, if necessary, for good spreading consistency. Beat in a few drops of orange food coloring, if desired. 2 of 3 Place 1 cake layer on a serving plate. Spread about 1 cup of the frosting over top. 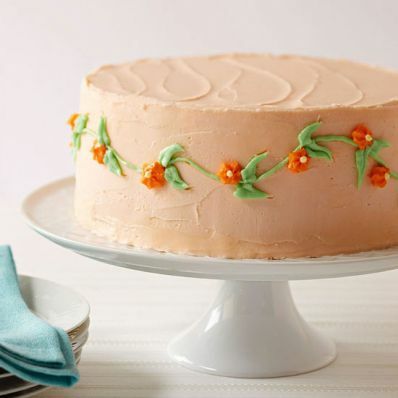 Place another cake layer on frosted layer and spread with another 1 cup of the frosting. Cover with remaining cake layer. Frost top and sides with remaining frosting. 3 of 3 Chill at least 30 minutes before decorating.